Donald Trump, the disruptive, anti-establishment president who spent years deriding much of what George H.W. 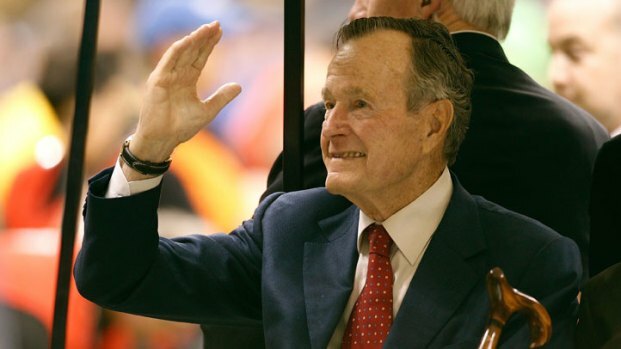 Bush stood for, set aside differences in politics and temperament Saturday to honor the iconic American and former president a day after his death. Trump declared a day of national mourning and ordered American flags to be flown at half-staff for 30 days to honor a man of "sound judgment, common sense and unflappable leadership." The president and first lady Melania Trump added that Bush had "inspired generations of his fellow Americans to public service." Bush, who was president from 1989 to 1993, was 94. The quarter-century since Bush left office featured his Republican Party's steady march away from his steely pragmatism and international partnership, culminating in the dramatic break from long-held GOP principles ushered by Trump's election. It coincided with a swing in the nation as a whole toward more tribal politics. While Trump spoke graciously, he has not always been so kind to Bush or his family. He ran against one of Bush's sons, Jeb Bush, in the GOP presidential primaries in 2016, and was sharply critical of the two-term presidency of another, George W. Bush. He shattered the unwritten norms of the small fraternity of Oval Office occupants by keeping up criticism of the Bushes from the West Wing. The White House announced Saturday that the Trumps would attend a state funeral for the former president at Washington's National Cathedral. The announcement marked a reversal from earlier this year, when the president was pointedly not invited to the funeral of former first lady Barbara Bush, the family matriarch and the late president's wife of 73 years. Melania Trump attended instead. The Trumps were informed of Bush's death late Friday while in Buenos Aires, Argentina, for the Group of 20 summit of rich and developing nations. Trump said he spoke with former President George W. Bush and former Florida Gov. Jeb Bush to express his sympathies. 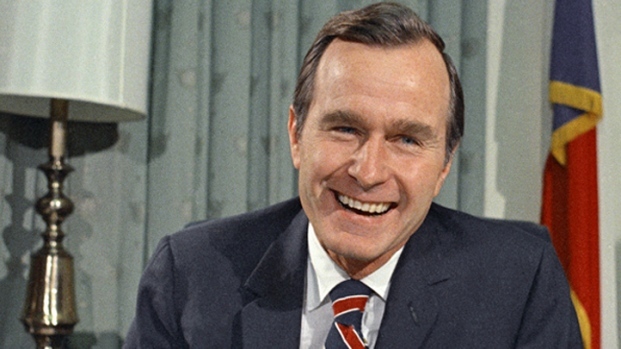 He praised the elder Bush, who died Friday, as "a high-quality man who truly loved his family." Sitting alongside German Chancellor Angela Merkel, he refused to answer whether he had any regrets over his past criticism of the Bushes. He did say that Bush's death "really puts a damper" on his participation at the summit. In South America, Trump canceled a planned news conference, tweeting that "out of respect for the Bush Family and former President George H.W. Bush we will wait until after the funeral" to hold one. Trump also announced that he has authorized the use of the iconic Boeing 747 presidential aircraft, known as Air Force One whenever a president is on board, to transport Bush's remains to Washington — a customary honor for a former president. Bush is to lie in state in the Capitol Rotunda from Monday evening through Wednesday morning. Trump also closed government offices Wednesday and designated it as a national day of mourning, which traditionally occurs on the same day as the Washington component of a late president's state funeral. He encouraged Americans to gather in places of worship "to pay homage" to Bush's memory, adding, "I invite the people of the world who share our grief to join us in this solemn observance." The proclamation hails Bush as "one of America's greatest points of light," a reference to one of the former leader's signature phrases about the impact of American civic culture. Trump mocked the "points of light" phrase at some of his campaign rallies this year. He contrasted it with his own campaign slogan, saying "Putting America first, we understand. Thousand points of light, I never quite got that one." In August 2015, Trump tweeted a dig at the presidency of George H.W. Bush, writing: "The last thing we need is another Bush in the White House. Would be the same old thing (remember "read my lips, no more taxes"). GREATNESS!" As a candidate, Bush promised "no new taxes" but reversed himself in office. Those harsh assessments were set aside in the Trumps' comments Saturday. "President Bush guided our nation and the world to a peaceful and victorious conclusion of the Cold War," the Trumps wrote. "As President, he set the stage for the decades of prosperity that have followed." "And through all that he accomplished, he remained humble, following the quiet call to service that gave him a clear sense of direction." They wrote that those whom Bush had inspired to public service were "illuminating the greatness, hope and opportunity of America to the world." Trump, the 45th president, paid tribute to "the life and legacy of 41."